The Wilmington High School boys bowling team won the Muskingum Invitational Monday a Royal Z Lanes. From left to right coach Joe Gigandet, coach Ryan Hottinger, Grant Pickard, Conner Mitchell, Elijah Martini, Jordan Tackett, Mason McIntosh, Brayden Rhoads, Jake Frazier and head coach Josh Fisher. The Wilmington High School boys bowling team won the Muskingum Invitational Monday at Royal Z Lanes. The tournament was hosted by Muskingum College. All teams bowled three regular games and six baker games in the preliminary round. The top four boys teams and the top four girls teams advanced to match play, a best of three baker game format. The Lady Hurricane lost in the first round of match play in the seven team girls tournament, falling to No. 2 seed Hilliard Bradley. Ariel Comberger was named to the all-tournament team with a 534 series. “The girls bowled really well,” WHS coach Josh Fisher said. On the boys side, Wilmington was the No. 1 seed following the prelims and then defeated No. 4 seed Wayne and No. 3 seed Clinton-Massie for the tournament championship. 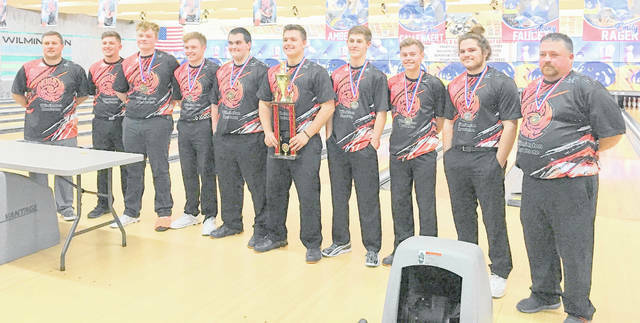 Fisher said the title was the first-ever tournament title for the WHS boys bowling program. Grant Pickard had a 624 series and was named to the boys all-tournament team.